After spying a great little DIY craft project on PInterest recently, using of all things, a common household Sharpie Permanent Marker Fine Tip 8 Pack . I was super impressed at the simplicity of using the sharpie to add interest to your household objects and spruce them up, with a 12 year old who has a fascination for all things crafty, not to mention me with my love of all things creative, our house is always full of colourful Sharpies, in fact I would have to say, every time we go the the stationary supply store we almost always come out with a new colour sharpie or two. 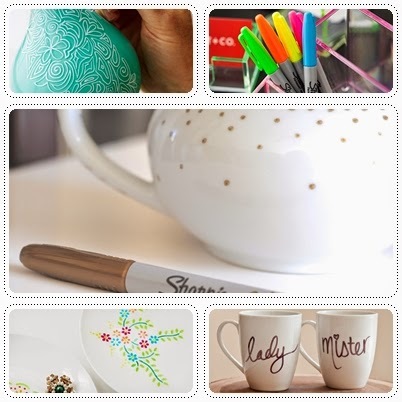 So today I thought I would share with you my top 10 favourite Sharpie projects in my ‘to do’ list for the future. No. 1 Is a fantastic lace style doodling on a lampshade base from Better Homes and Gardens taking something from simple to extraordinary. No. 2 Is a really cool way to funky up some inexpensive clear desk accessories with neon Sharpies, of course, you would have to have a tidy desk to showcase this lovely DIY alteration, they would get lost on mine, but would be super cool for a teenager. No. 3 Buy a simple white inexpensive teapot and custom decorate it for a unique talking centrepiece when you have guests over. No. 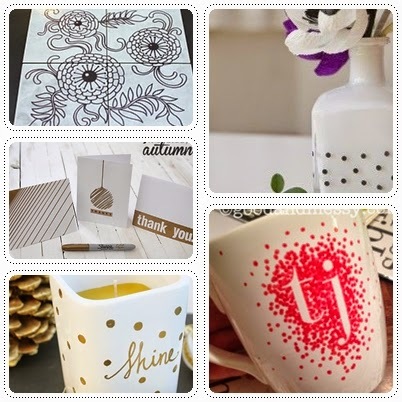 4 I love the use of stencils in this project, so easy and yet the perfect way to have personalised crockery. Of course, even though all the projects suggest you bake on your Sharpie ink, I would still most definitely not be using it on anything touching food directly, but for decorative pieces it’s the perfect touch. No. 6 This tile artwork is amazing and the impact is just fantastic, I am a big fan of split images that work together. No. 7 I love the simplicity of this idea using black polka dots on a white vase to create contrast and impact. No. 8 Some DIY stationary with metallic Sharpies is a must for the creative type, a little personal thank you or birthday card. Love these. No. 9 This simple homemade gold Sharpie decorated candle is a really simple idea. No. 10 had to be the project that started this fascination with Sharpie based projects, a personalised coffee cup. I love the simplicity of this idea and have no doubt that buying a plain ceramic cup for my daughter to have fun with will be so cute. I found quite a few projects using this concept but my favourite is one that used letter stickers and dots as I would not trust my handwriting to give the effect needed to achieve the results in project No. 5. Hope the above has inspired you to grab a Sharpie Permanent Marker Fine Tip 8 Pack and have some fun, I will certainly be having a little crafty time with my daughter with some of these ideas and maybe she will even let me borrow some of her Sharpies if I need a colour different from my own little stash.